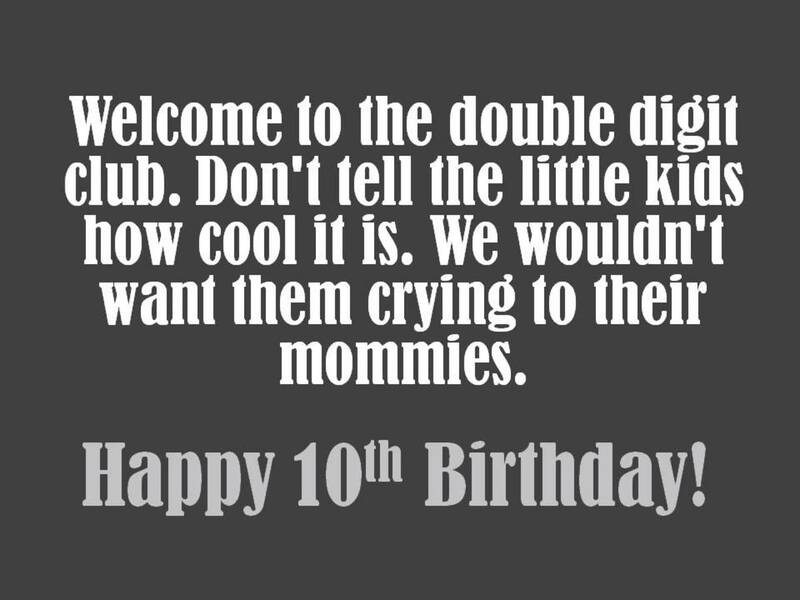 Being 10 is a big deal because you finally get into the double digits. You have to wait another 90 years to add a third. Kids usually like things that are milestones of growing because they get to feel proud and independent. 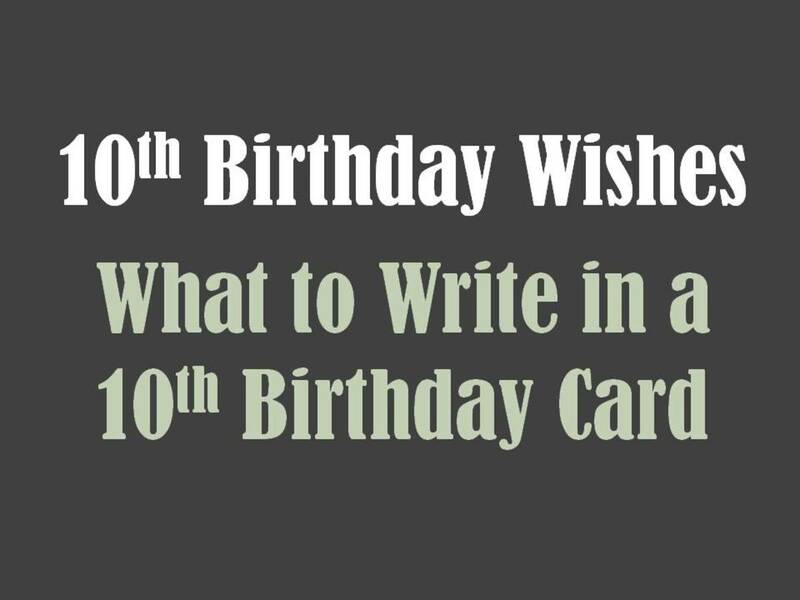 If you're trying to figure out what to write in a 10th birthday card, you'll find many examples here. Humor can be used, as long as it's pretty immature and goofy. Inspirational messages should be direct and complimentary. Your message can help make this milestone a monumentally special day. Some of these are funny and some are silly. You be the judge. 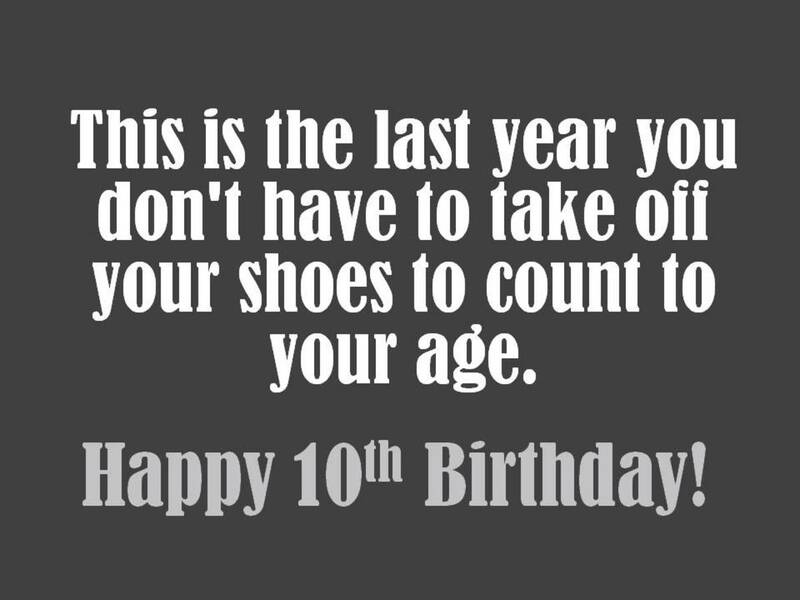 This is the last year you don't have to take off your shoes to count to your age. Welcome to the double digit club. Don't tell the little kids how cool it is. We wouldn't want them crying to their mommies. 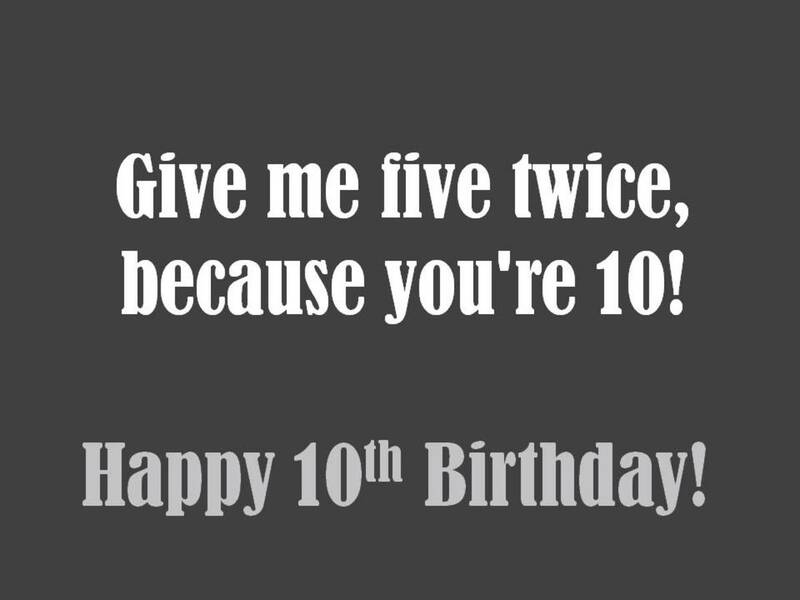 Give me five twice, because you're 10! You're finally old enough to understand that only little kids who aren't 10 yet get birthday gifts. You're too old for gifts now, right? 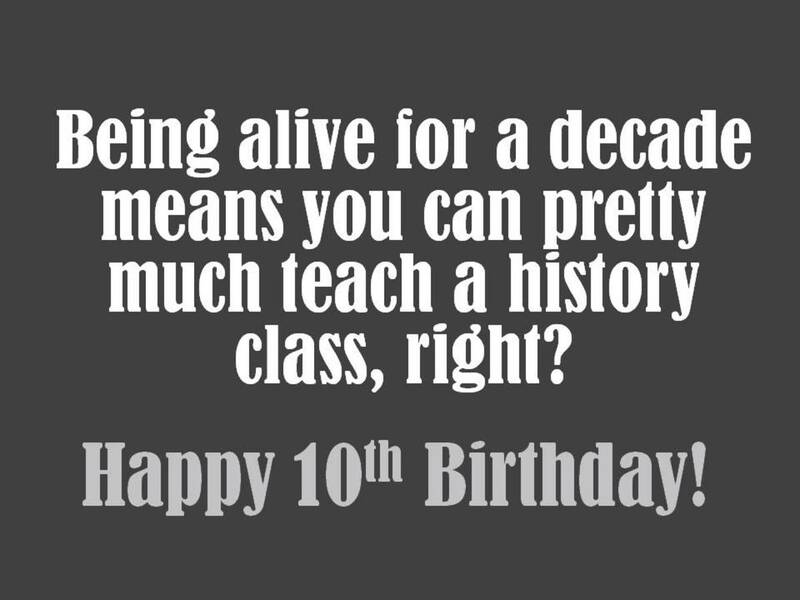 Being alive for a decade means you can pretty much teach a history class, right? If you had a time out, it would be for 10 minutes. If you had birthday spankings, how many would you need? You are the youngest 10 year old I know! These are some nice birthday messages to inspire or motivate. Tailor these to perfection for your card. You are responsible for many great memories over the last 10 years. Thanks for bringing joy to those around you over the last decade. I can’t imagine how excited you must be to reach your first double-digit birthday. You have grown over the past several years, not only in height, but in personality and strength. What a difference a year makes! 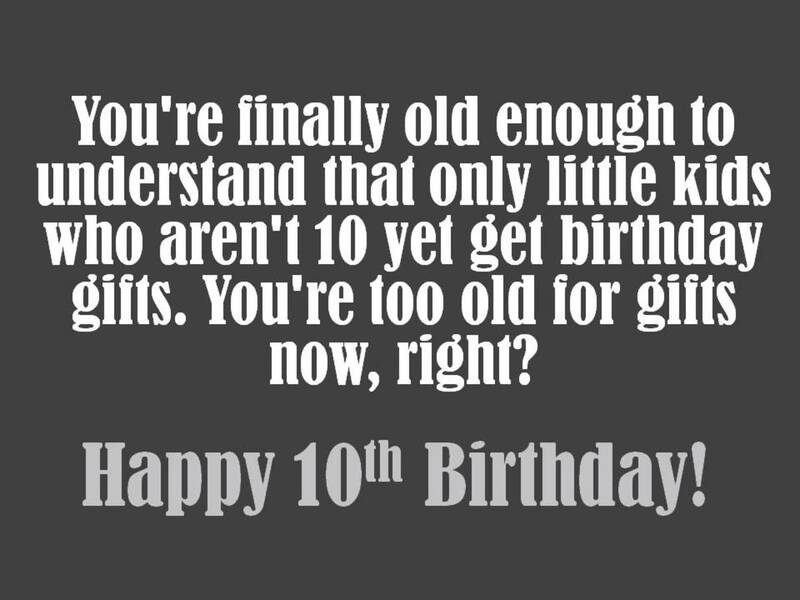 I’m sure it feels just a little different to turn 10-years-old than it has for your previous birthdays. May your preteen years will be full of opportunities to learn and grow. You have done well and will continue to do so. Turning 10 is significant. Your responsibilities will increase, but so will your capacity for fun and achievement. I will enjoy watching you as you move forward. Well, no more childish quotes and clichés. You have officially transitioned out of childhood into your preteens. Things will begin to change more rapidly from this point. Turning 10 is a great time to discover who you are and your purpose. You have a lot to offer the world. 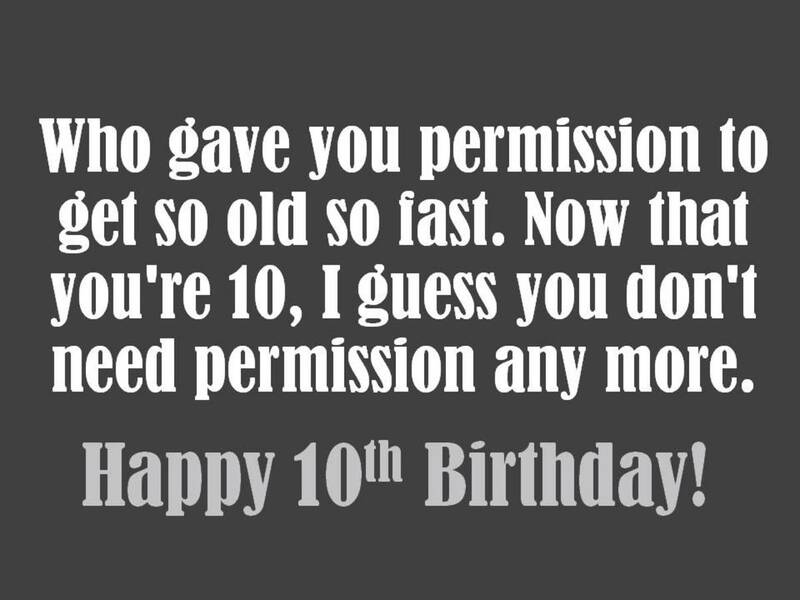 Now that you're 10, people will began to look at you differently. Many will expect more from you, but more responsibilities come with more respect and opportunities. You at that point where you still get to enjoy being youthful while experiencing the benefits of growing up. You have now entered a brand-new chapter in your life. You are no longer a baby or a little child. 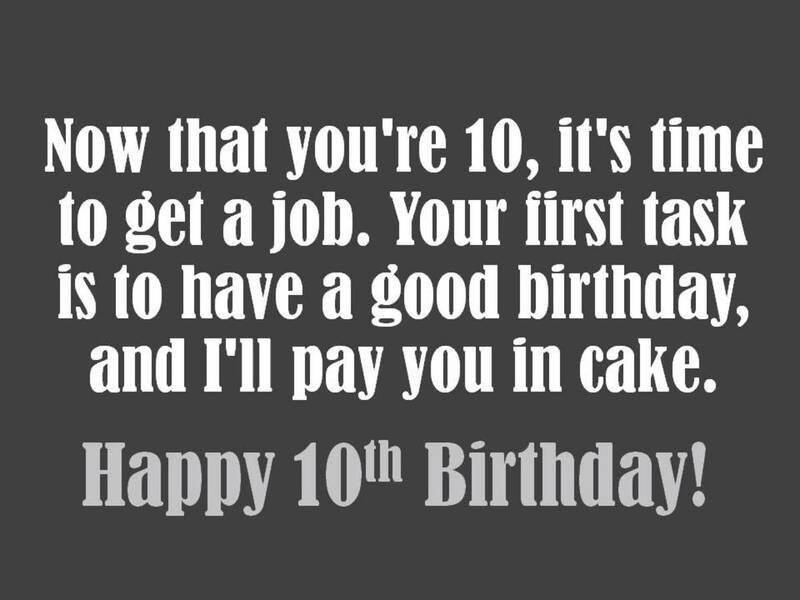 Turning 10 is an cool time in your life. I am looking forward to watching you meet the challenges and accept the opportunities that are coming. You are an extremely special person. You bring joy to those who are around you. You have a way of making even the saddest person smile, and your ability to see good in everything is quite special. I hope that your 10th Birthday is as special for you as you are to me. You are about to enter one of the most exciting and fascinating times of your life. At 10 you still have the opportunity to explore life under the protection of your parents while having the freedom to think for yourself and make some of your own choices. You have always made us proud. You are smart, caring, and considerate. Today is about making you feel special. 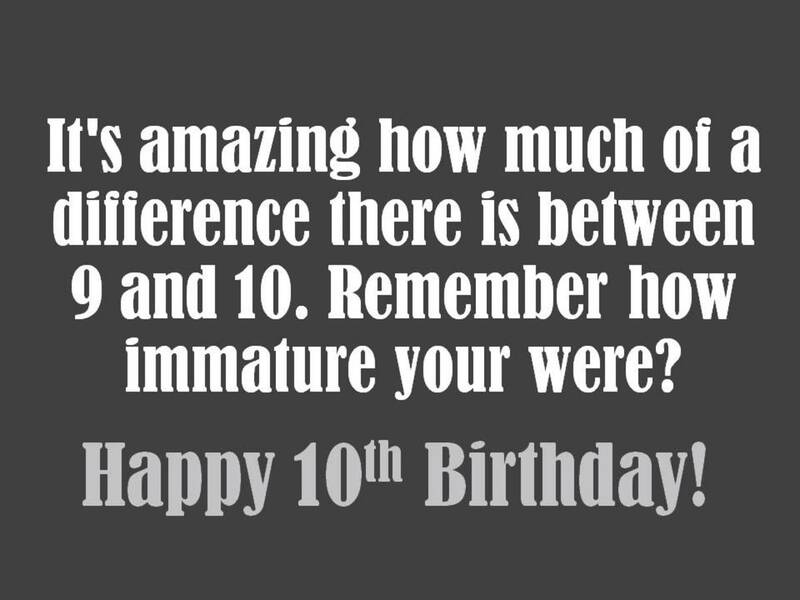 You have turned 10 and that is a huge milestone! You have given us many reasons to smile over the past 10 years, and we know that there will be many more moments of excitement and joy ahead. You are extremely special, and we hope that you enjoy your special day. You have grown up right before our eyes and we are proud of you and everything that you have done in 10 years. Enjoy your day! A birthday is a time to reflect over the previous year and count the ways you have grown. You have grown taller and smarter, but you have also grown in wisdom. We see it in the small decisions you make. 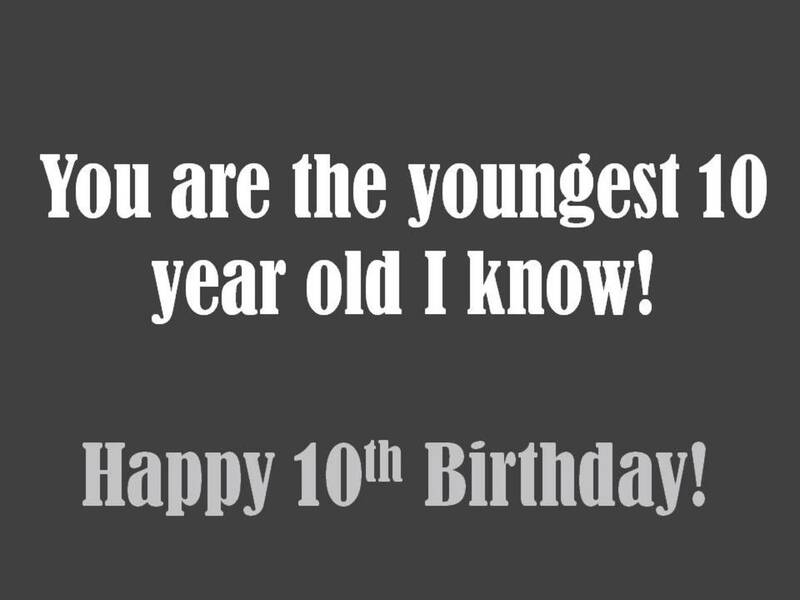 You are changing each day, and your 10th Birthday is simply a reminder of how much you have grown. 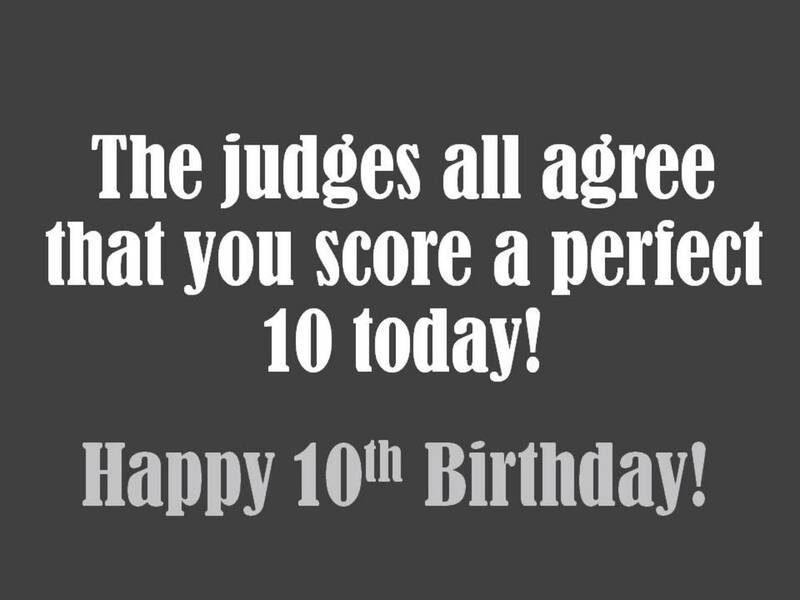 You are the BIG 1 – 0 now. Wow, how times flies! You have been the sweetest kid a parent could ask for. Watching you grow over the past 10 years has been a delight. You have provided many moments of joy and pleasure for us. We are looking forward to the next 10 years and all of the wonderful accomplishments you will achieve. These are just a couple examples of poems for a 10th birthday card. You may want to try writing your own using personal details. You amaze me and make me say, "Wow!"